* Some 1 NIKKOR lenses have adopted a stepping motor. AF-P lenses realize fast and quiet AF operation via the adoption of a stepping motor* for AF drive. * Because AF-P lenses incorporate a stepping motor, the number of compatible cameras is limited. Even for compatible cameras, firmware update may be required. 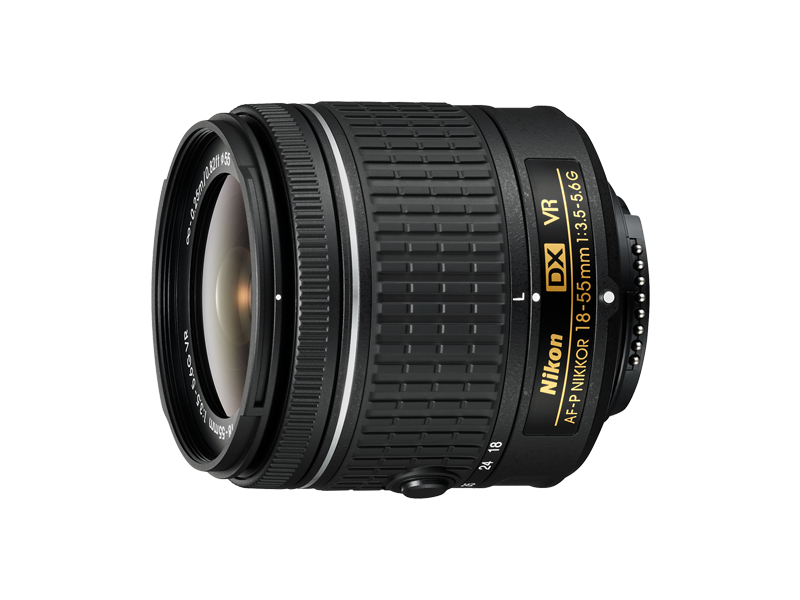 Compact and lightweight, DX-format compatible, 3.1x normal zoom lens with 18-55 mm* focal-length range and f/3.5-5.6 maximum aperture. * Angle of view is equivalent to that of a 27-82.5 mm lens in FX/35mm format. Two aspherical lens elements are employed to deliver superior optical performance with minimal lens aberrations. Vibration Reduction (VR) provides an effect equivalent to a shutter speed 4.0 stops* faster. Adopting a setting system using the camera menus, lens settings can be performed on the camera*. * Because focus mode (AF/MF) and VR ON/OFF are set using the camera menus, the number of compatible cameras is limited.